There's good news if you're in the market for a brand new flagship phone, because the selection is better and wider than ever – but that does also make choosing a handset tricky. Here we've got two of the top contenders: the OnePlus 6T and the Google Pixel 3. While both phones are sleekly designed and packed with powerful components, which one is the right one for you? We're going to weigh up how these two 2018 handsets compare in all the categories that matter, from waterproofing to camera quality, to help you decide. We'll have to give this round to the engineers behind the OnePlus 6T – they've managed to reduce the bezels to almost nothing, and to embed a fingerprint scanner under the front display, and to significantly reduce the front notch to a small teardrop shape. And the three colours, two variations of black and thunder purple, look fantastic too. That's not to say the Google Pixel 3 is a bad-looking phone though. It doesn't have the chunky notch of the larger Pixel 3 XL to distract your eyes, and we really like the two-tone effect around the back that we've seen from previous Pixels (this year though, it's made from textured glass). Your colour choices are Just Black, Clearly White, and Not Pink (a short of light, pink-ish shade). You're getting a lot more screen with the OnePlus 6T – 6.41 inches (at a 1,080 x 2,340 resolution) as opposed to 5.5 inches (at a 1,080 x 2,160 resolution). The Pixel 3 is more pocket-friendly as a result though, coming in slightly below the OnePlus 6T in terms of height, width and depth. Under the hood these phones are fairly well matched: for example, both the OnePlus 6T and the Google Pixel 3 are powered by the Snapdragon 845 chip, which has been the processor of choice for Android flagship manufacturers in 2018. You get more RAM with the OnePlus phone though – 6GB or 8GB depending on your region and choice of models, compared with the 4GB in the Pixel 3. That shouldn't make too much of a difference in most apps, but it's worth bearing in mind for the most demanding tasks and games. With the OnePlus 6T you get a choice of 128GB or 256GB of internal storage, whereas the Google Pixel 3 only offers 64GB or 128GB. Neither phone has a memory card slot to allow you to expand that. On paper then, the OnePlus 6T wins out in terms of raw specs, though the Google Pixel 3 phone is no slouch. As Google can work on both the hardware and the software of its Pixel phones at the same time, it can get them running together effortlessly – and remember both phones use the same Snapdragon 845 chip, the most important component in terms of performance. So far it's been the OnePlus 6T in the lead, but the Google Pixel 3 is perhaps the better option in the mobile photography department: its rear-facing 12.2MP single-lens camera is backed with some seriously impressive image processing tech, and can produce genuinely great photos. The OnePlus 6T has a rear-facing 16MP+20MP dual-lens camera, and while it can still take some impressive shots, it doesn't quite hit the heights of the Pixel 3. Both Google and OnePlus have made their own exclusive versions of Android 9.0 Pie for these phones, and we like them both – the Pixel OS features tight integration with the likes of Google Assistant and Google Lens, while the OxygenOS that OnePlus develops finds a nice balance between intuitive minimalism and visual flourishes. If we had to pick a winner, we'd say the Pixel phone just edges it. The Pixel 3 also has full IP68 waterproofing and dustproofing, which the OnePlus 6T doesn't have (it is water resistant up to a point, OnePlus says, but it doesn't have an official IP rating). Another difference you want to make a note of is that the Google Pixel 3 has wireless charging available (a first for Pixel phones this year), while with the OnePlus 6T you have to stick to using a cable. As you can tell from our comparison above, these are two very well-matched handsets. The OnePlus 6T has arguably the better design, as well as more impressive specs, but the Pixel 3 from Google has market-leading photo-taking capabilities, Google's vision of how Android should look, and tight integration with other Google services. Something we haven't talked about yet is price. 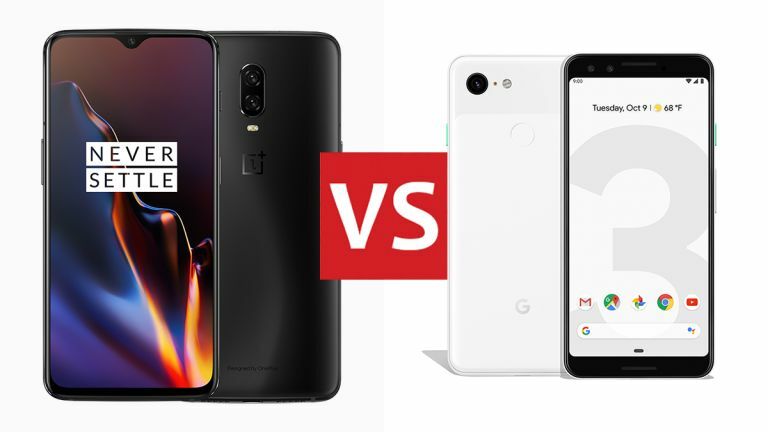 Check the widgets on this page for the most up-to-date deals, but you should find that the OnePlus 6T is significantly cheaper than the Google Pixel 3 – unless you really need that amazing camera or are a true Google loyalist, the OnePlus 6T is probably the better value phone. In the end though, we love both of these phones and would definitely include them both on our lists of the top Android handsets you can buy today... if you've got the cash. If you're buying one or the other, be sure to carefully compare the specs and features (like unlimited Google Photos storage with the Pixel 3) before buying.